Jennifer Ball Tufford is the proud mother of four grown children and one teenaged dog. Her days are spent being “mom” to several hundred kids as an elementary school secretary. She writes about life after divorce, single parenting and the glorious hilarity that is dating after 50. More than anything, she wishes her mom could see this show. 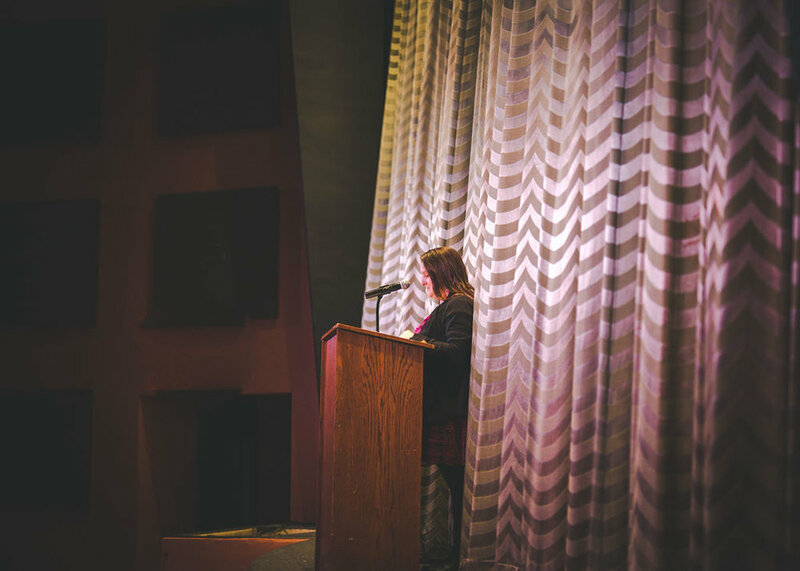 In 2013, Jenny read, “Broken Bowl” from the LTYM stage. Prinna Boudreau is a freelance technical writer, teacher, and storyteller. 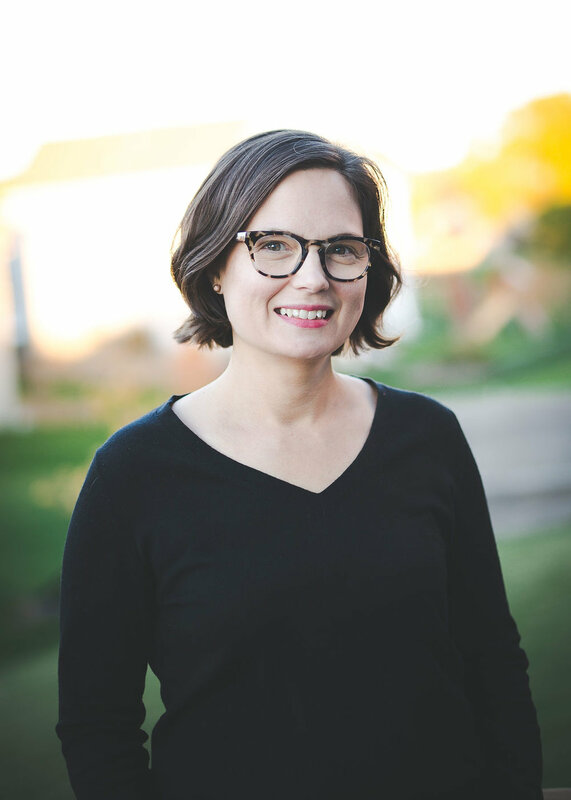 A native of Minnesota, she earned her MBA in English from Minnesota State University where she now teaches writing courses. 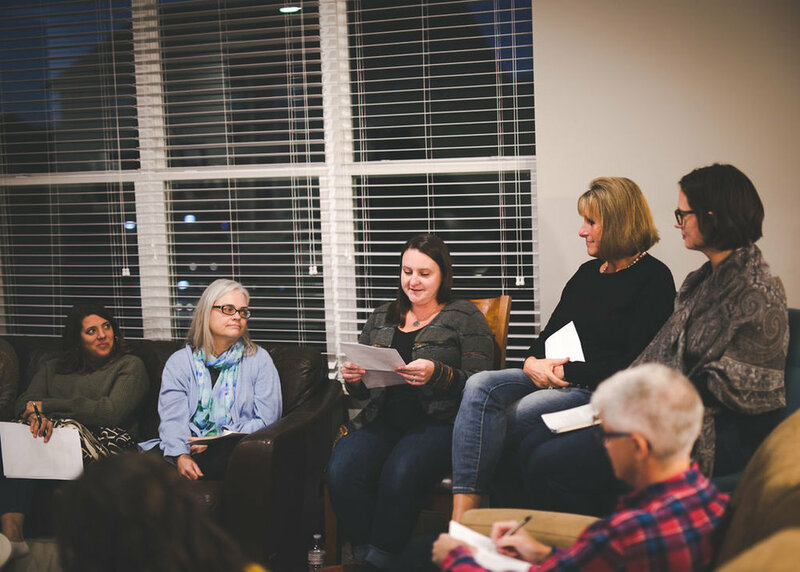 After the loss of her 10-month-old daughter to SIDS, she began focusing on writing about motherhood, loss, and grief. 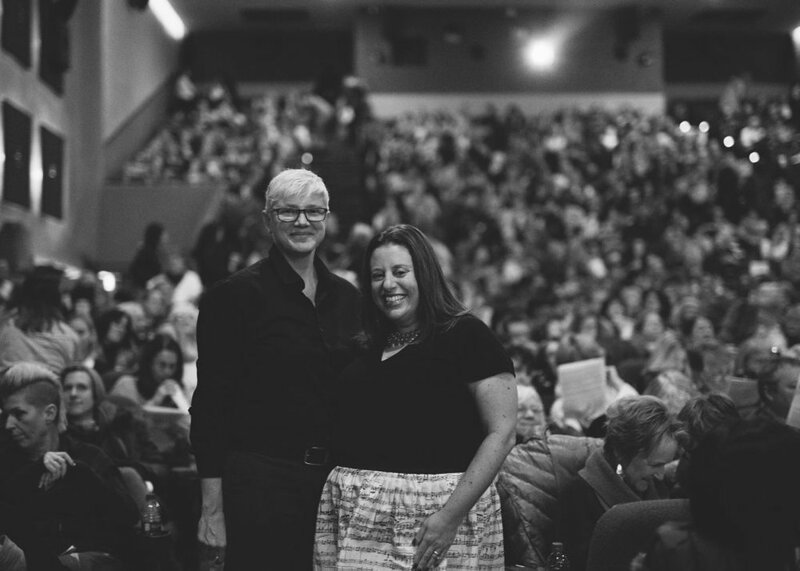 She had the unique opportunity to tell her first story for “The Moth” in 2012 to an audience of over 1,000. She lives in Shakopee, Minnesota with her husband and three children. She blogs at Prinna Writes and is working on a memoir. Avivah Brown was born in NY, raised in Atlanta and is now a self proclaimed Minnesotan. 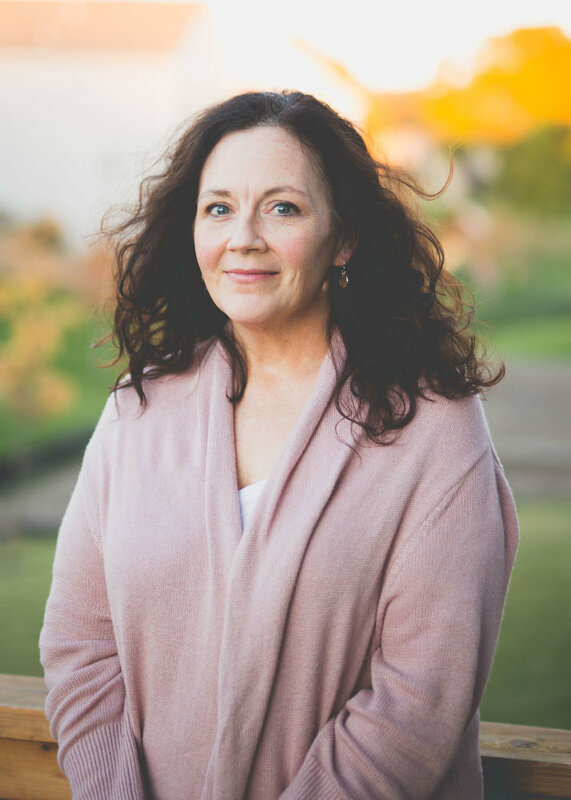 She is a public speaker, non-profit manager, singer, and a mom to many foster loves. Her career finds her spending days partnering local organizations with schools to provide meals to kids living in food insecurity. 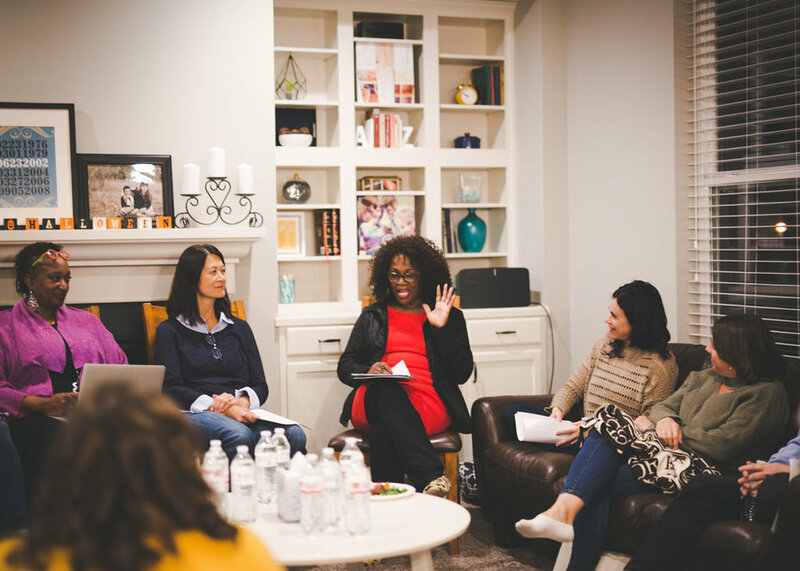 In addition, she is a local advocate for the needs within the foster care system, and is passionate about seeing kiddos in healthy homes. In her spare time she can be found drinking great coffee, trying a new dish and fully embracing each new day. You can find her adventures here: as1wefoster.com. 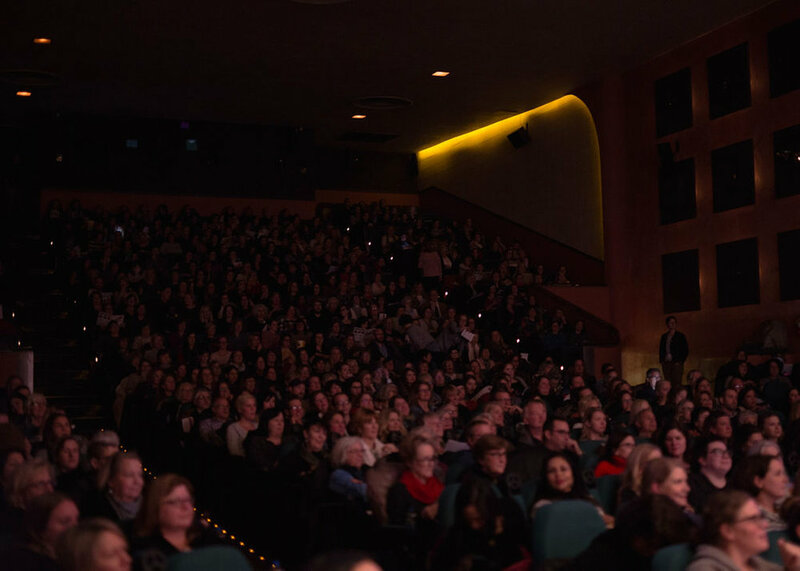 In 2018, Avivah read, “A Mother To Many” from the LTYM stage. Danielle Daniel loves creating and performing. Her vivacious style fills the stage with a swirl of characters. She is an actress, creative writer, teaching artist and master storyteller. Her storytelling programs and tour shows have been presented in Europe and the United States. 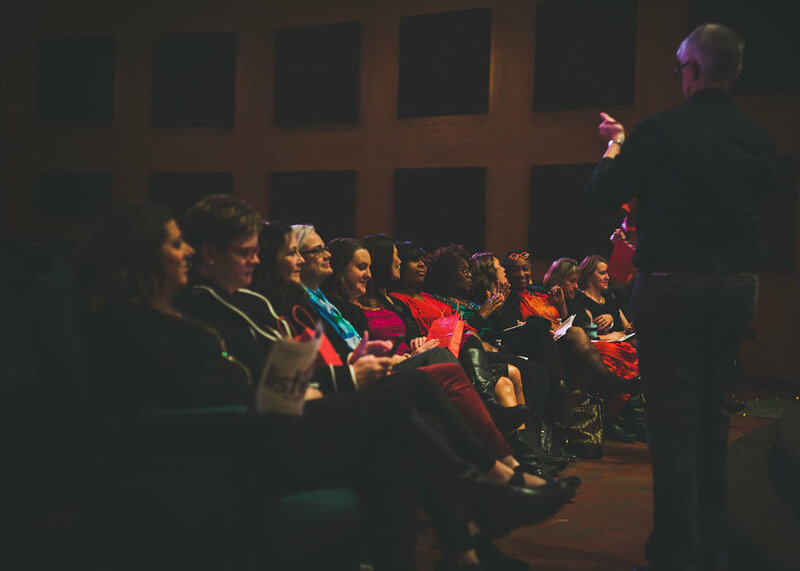 She has worked in many schools, colleges, and community organizations using the art of storytelling to entertain, educate, motivate and empower people of all ages. 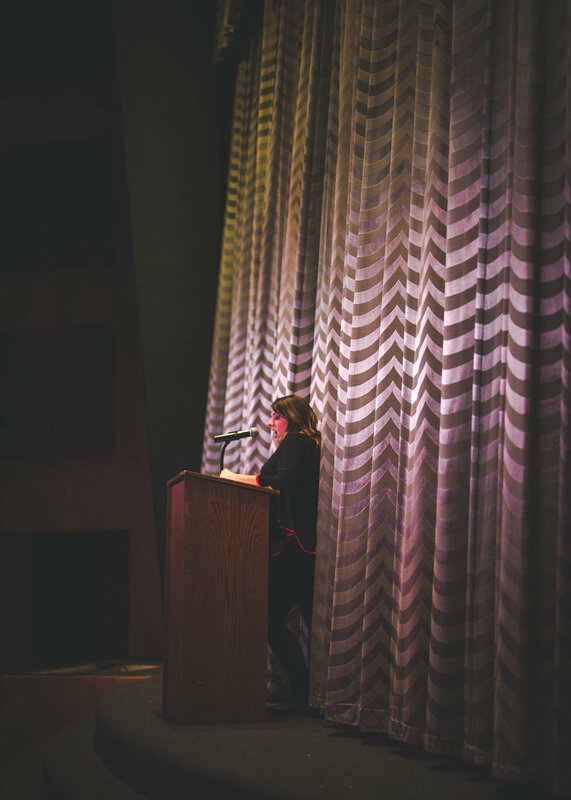 During her career, she has received a Jim Dusso Artist Award, Minnesota State Arts Board Fellowship, Many Voices from the Playwright Center, and a Jerome Fellowship. 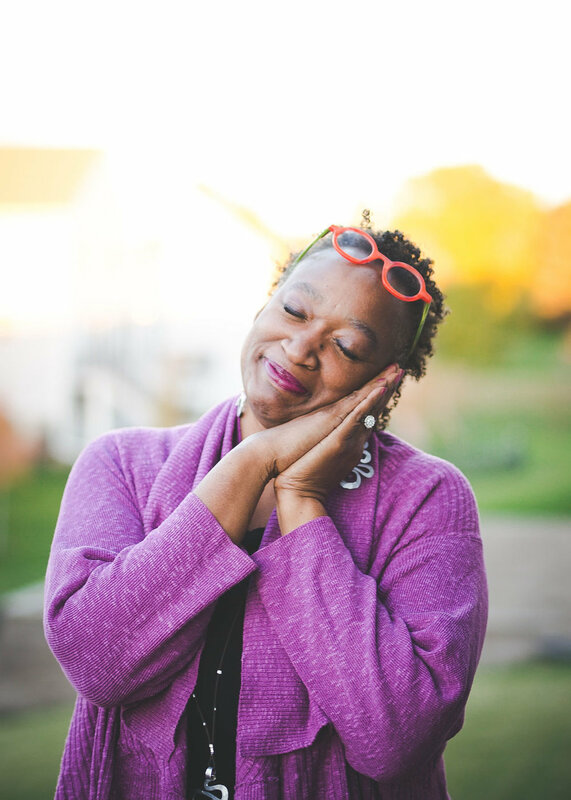 She is the author of a children’s book, “The Ghost of Old Man Willie,” two plays, Voodoo Child, Sugar and Spice a Black Woman’s Melody, and The Magic of Laughter. 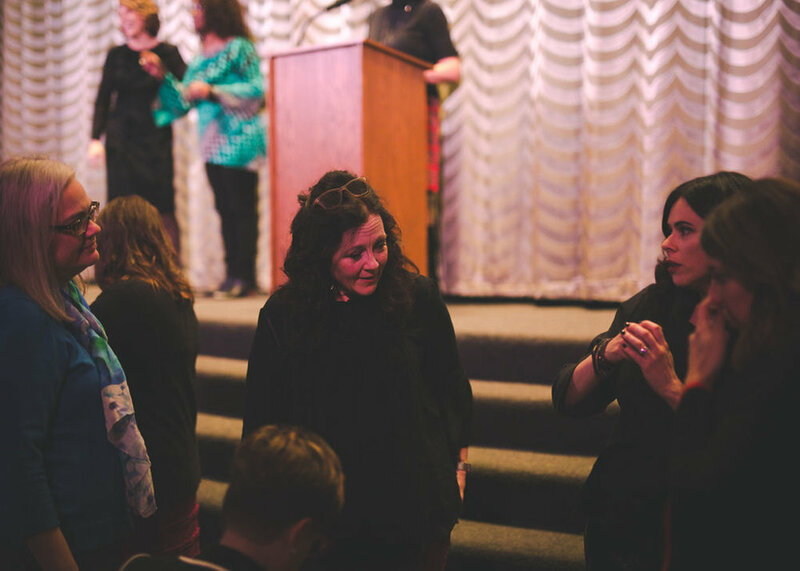 Danielle believes our stories are healing; we should treasure and collect them for our future generations. She received a B. A. Degree from the University of Minnesota, and completed the Kennedy Performance Arts Center “Artist as Educators Program” through Iowa University. Her workshops and artist residencies are designed to help students find and develop their own creative voice and style. 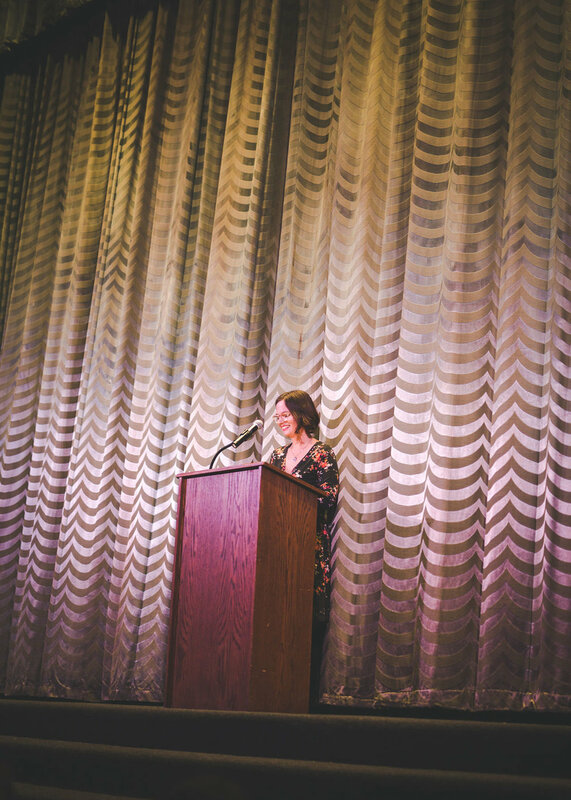 In 2017, Danielle read, “A Mother’s Love” from the LTYM stage. Kate Gjerde is the winner of the 2018 First Horizon Award for work by a debut writer, and she was short-listed for The Eric Hoffer Book Award for her memoir, Given Away, a story of adoption and reunion with her birth family in Korea. 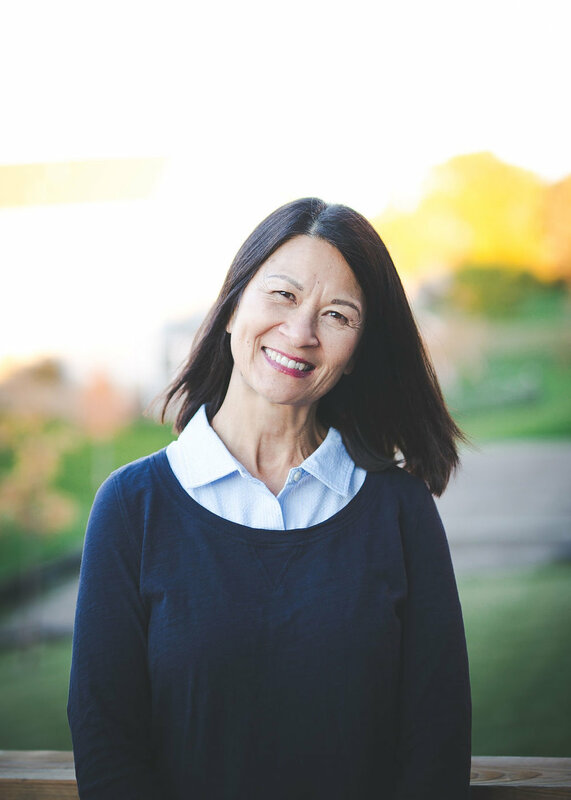 She uses the pen name, Kate Anne Kang, to honor her Korean birth mother. She is married and has two almost adult children. She is an educator in Hopkins working with English language learners. In her free time she enjoys camping in her vintage camper and plotting her next meal. 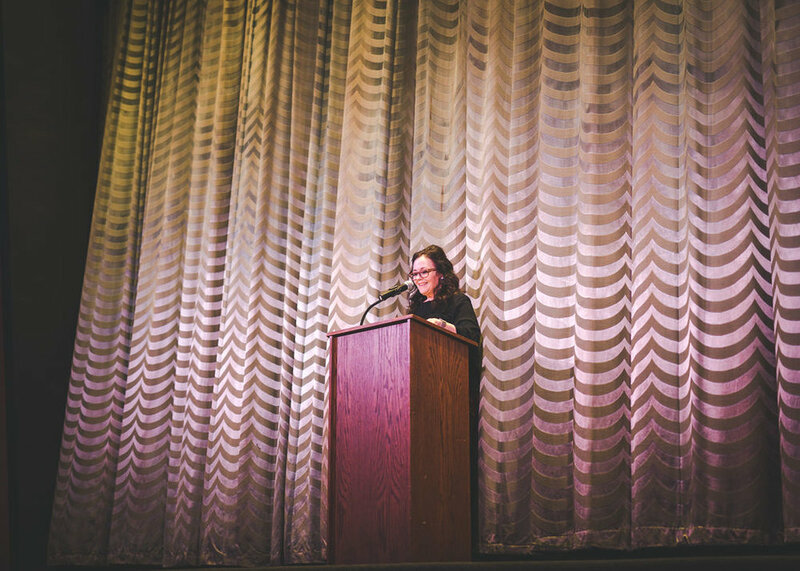 In 2016, Kate read, “You, Me, Same-Same” from the LTYM stage. Ann Hohenshell is a mom, spouse, writer and avid reader. 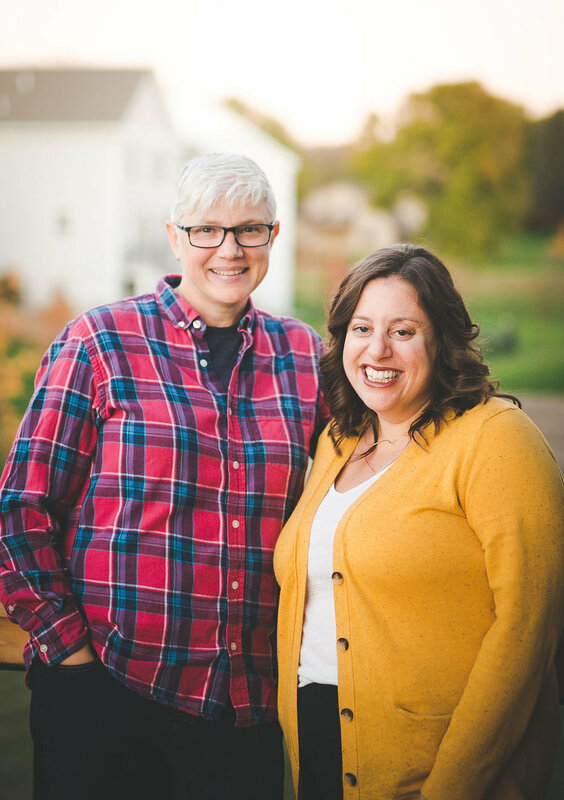 She and her husband are native Iowans and slowly coming to accept that their three children consider themselves Minnesotans. Ann likes to root for the underdog, drink coffee and collect family stories. 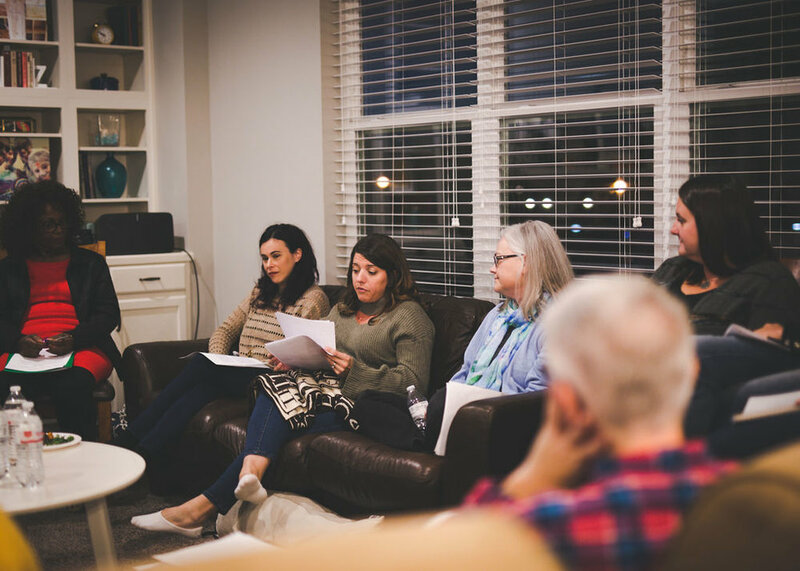 She met some of her best friends in writing groups and writes about her life as a daughter, mom and outside observer. 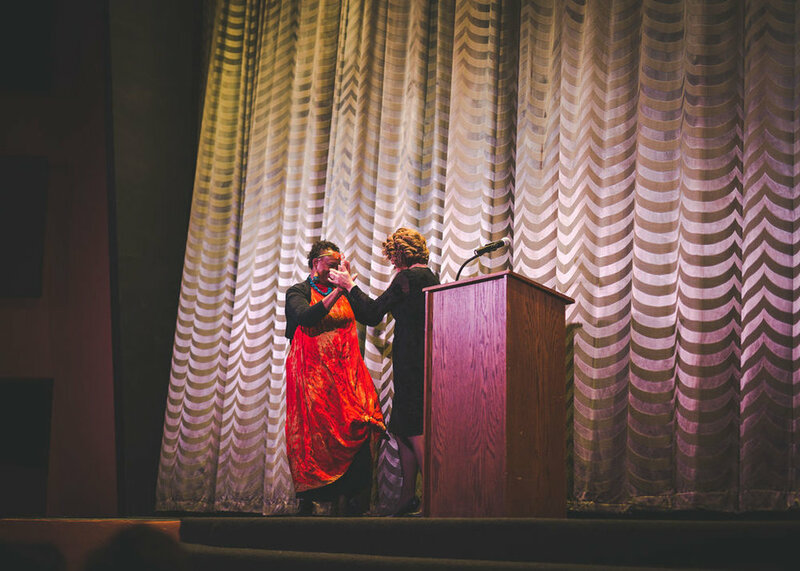 In 2017, Ann read, “Rita” from the LTYM stage. 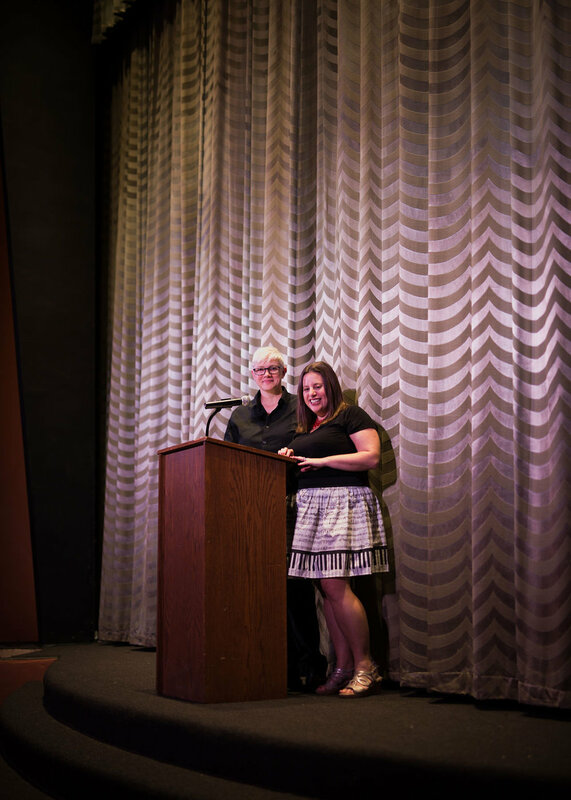 Leslie Lagerstrom is the creator of the blog Transparenthood™, which chronicles her family’s experience raising a transgender child. Through her writing, she has built a national advocacy platform for transgender children and their families. 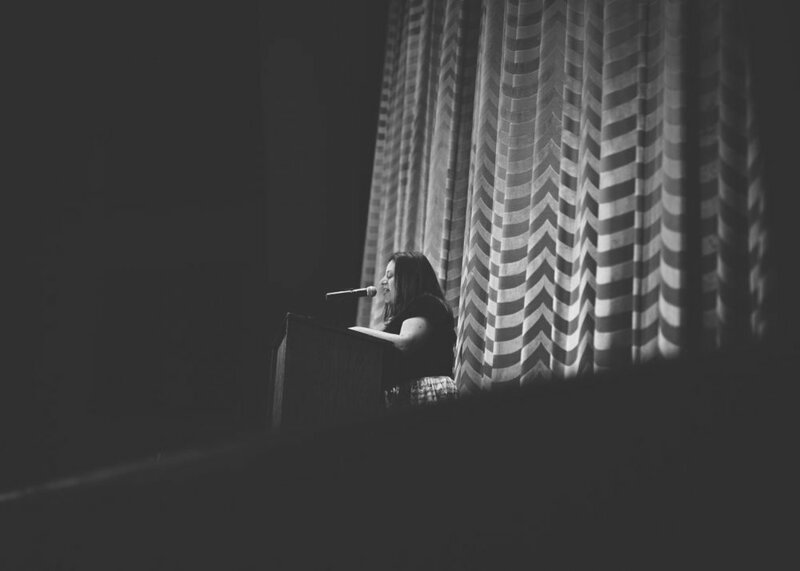 Her essays have been featured in three anthologies, turned into a stage production that toured the United States, and can be found in The Huffington Post. Committed to spreading awareness, she is frequently invited to speak in front of audiences across the country, which include K-12 school communities, college students and university administrators, medical professionals, and employees of Fortune 500 companies as well as national associations representing lawyers, school psychologists, and social workers. 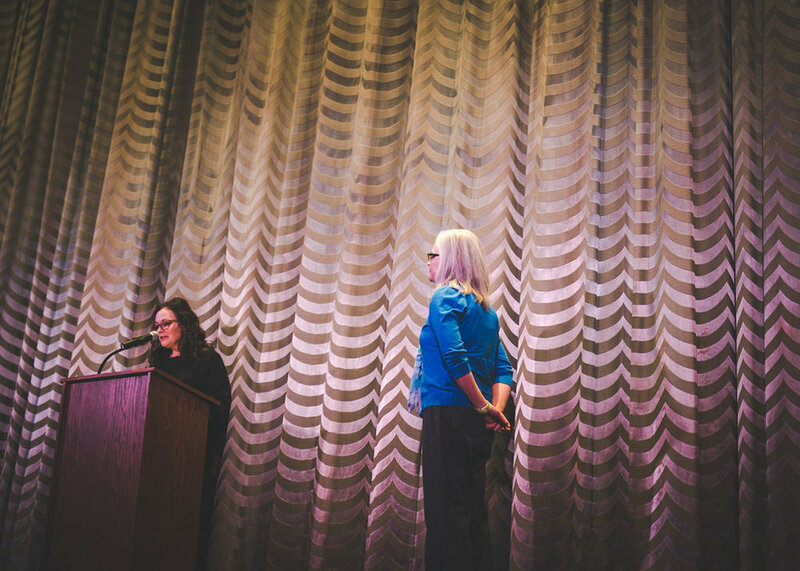 In 2014, Leslie read, “The Dance” from the LTYM stage. Hawona Sullivan Janzen is a Saint Paul based storyteller, poet, singer, and composer who believes that art is the only thing that can save us from ourselves. 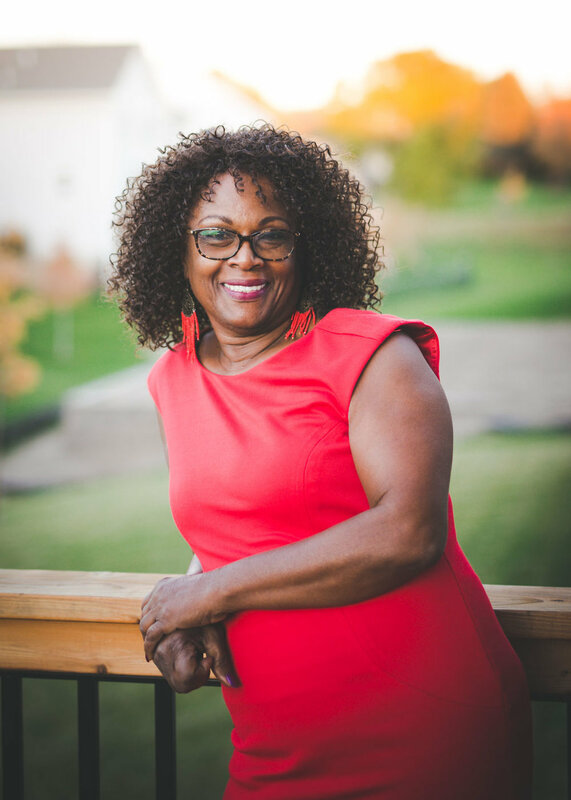 She is the co-founder of the Witness Creative Writing Program at the University of Minnesota and has done commissioned work for a variety of organizations including the St. Paul River Stewards, Silverwood Park, and the Minnesota African American Museum. Her jazz opera, "Clean" debuted at the Soap Factory Gallery in 2016. When she is not home with her family, she can be found performing around town with the Sonoglyph Music and Poetry Collective, creating shadow puppets at the Monkeybear Harmolodic Workshop, or working on a collaborative photo-poetry art installation project in the Rondo Neighborhood scheduled for debut in late summer of 2018. 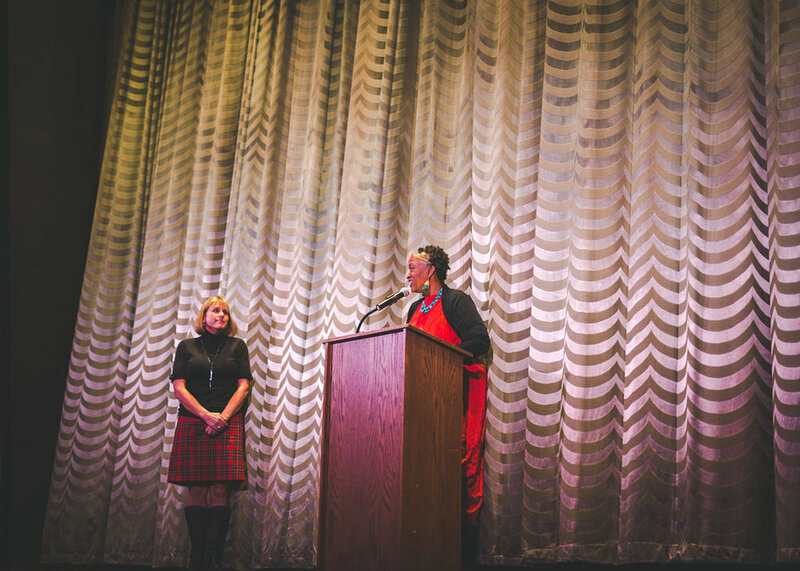 In 2016, Hawona read, “Grandmother and Beebee” from the LTYM stage. Andrea Mullenmeister is a ceramic artist and a work-at-home mom. Her kindergartner, Jaxson, thinks she should make even more pottery so he can buy more Lego sets. Jaxson was born prematurely at only twenty-three weeks gestation. Being such an early preemie, he has faced a number of obstacles including a three month NICU stay, ten surgeries, chronic health conditions, Autism, and ADHD. Andrea is passionate about advocating for her son and herself. 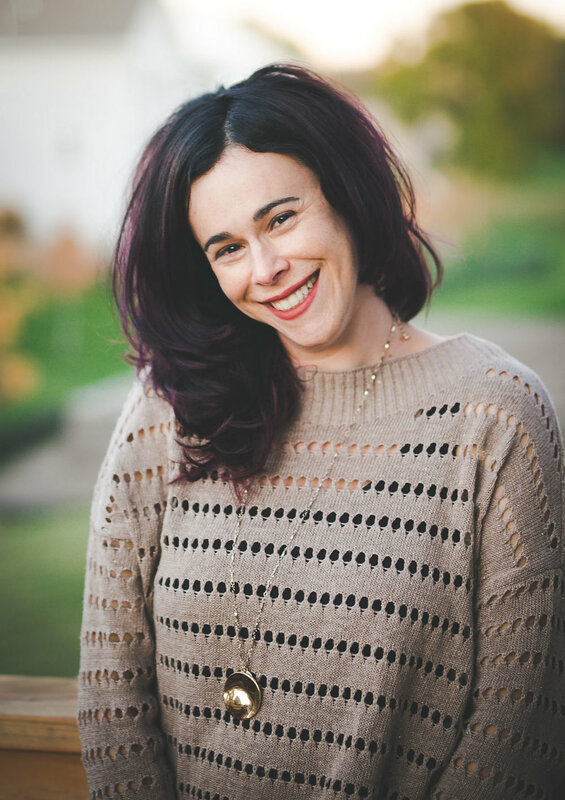 Her essays about prematurity, parenting a child with extra needs, and grief have been published nationally. 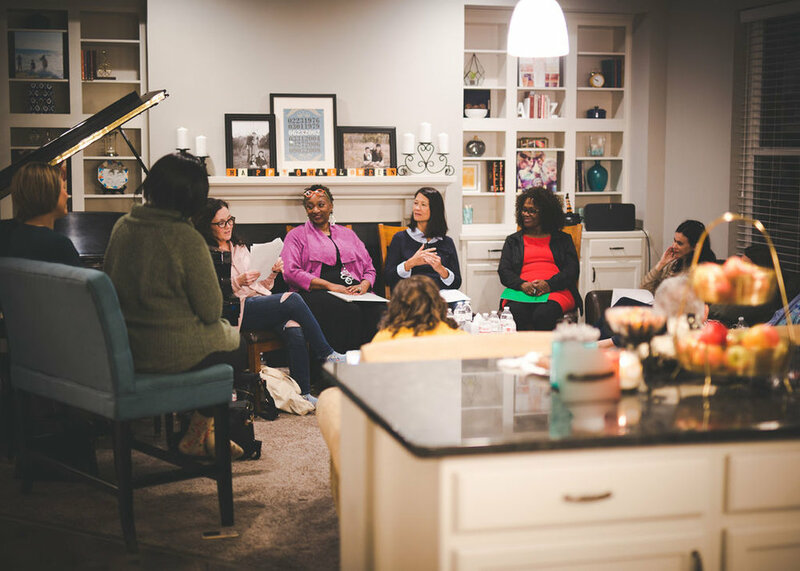 You can find Andrea at An Early Start where she writes about her family’s story of love, hope, and survival. 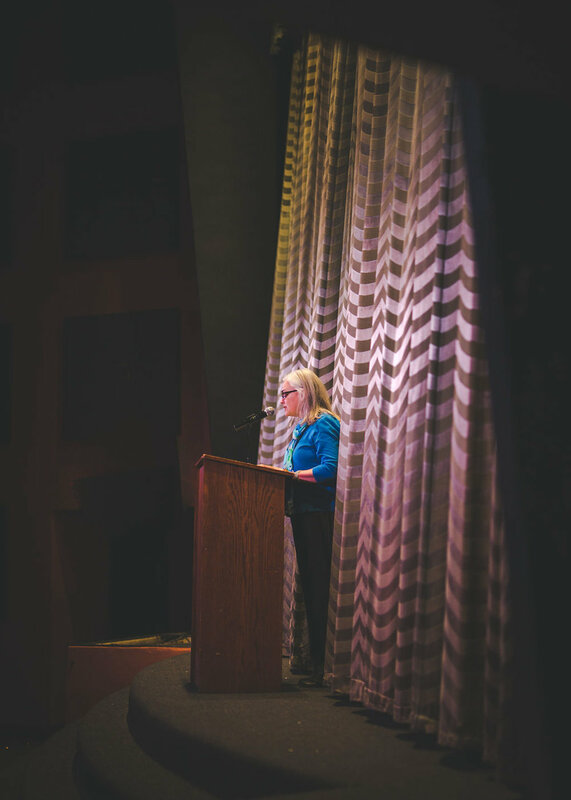 In 2016, Andrea read, “Afraid Of Heights” from the LTYM stage. 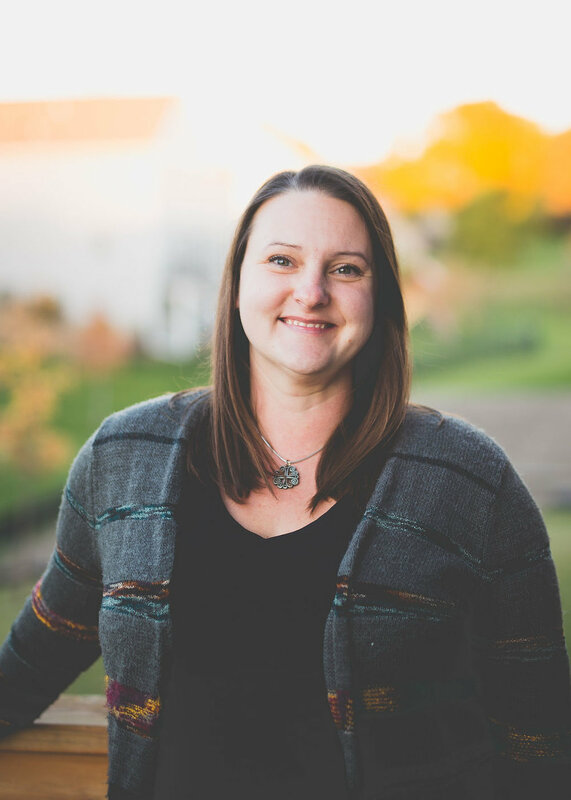 Laura Taple is a small business owner who traded in office life to manage the family business, Katzman Monument Co. She enjoys the challenge of running a business and combining her people skills with the surprisingly artistic side of designing memorials. Laura believes it’s a privilege to assist families in honoring their loved ones. 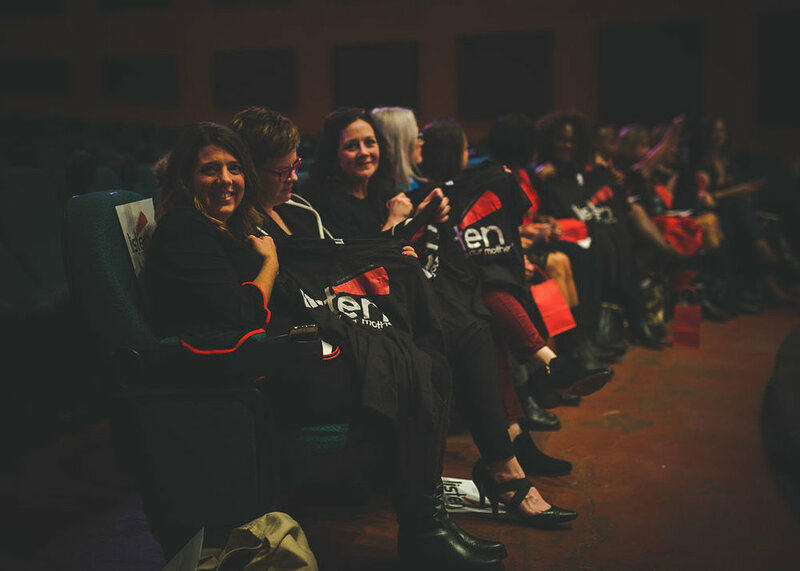 When not wandering through cemeteries, she is most in her element when wearing red lipstick, meeting a friend for coffee, traveling, telling stories and developing meaningful connections. She lives in S. Minneapolis with her magical husband, spirited daughter (age 6) and curmudgeonly Shih Tzu, Barry. 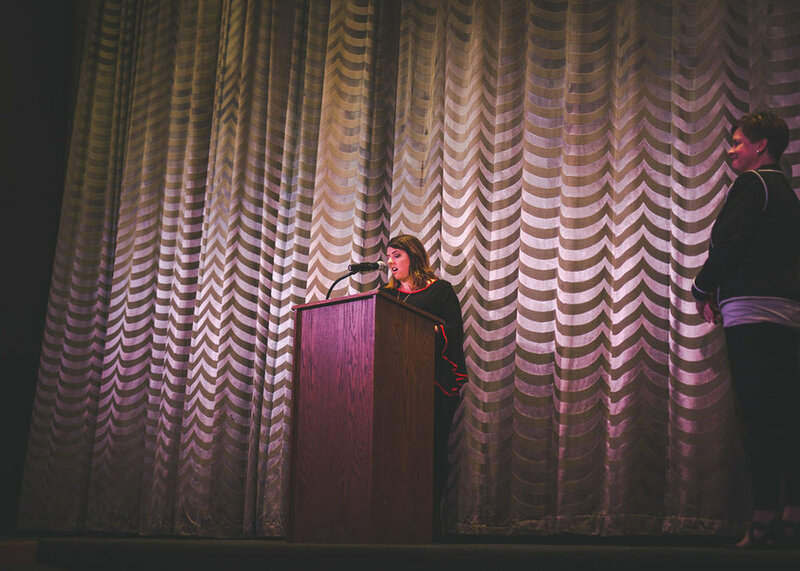 In 2018, Laura read, “Down The Rabbit Hole” from the LTYM stage. Sally Vardaman is a writer, comedian, producer and contract manager. Her fascinations include healthcare economics, justice system reform, the god complex, and comedic satisfaction. Her creative focus for 2019 is a book of essays to her three teenagers, and a show of stories exploring the trouble with love and power. You can read her more serious ponderings at sallysmart.wordpress.com and view her upcoming events on her public Facebook page. 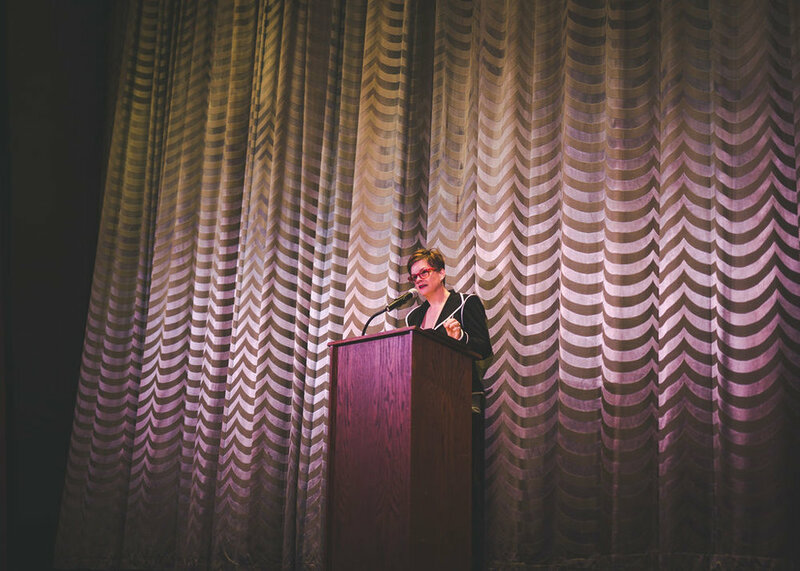 In 2017, Sally read, “The F Word” from the LTYM stage. Tzitel Voss is a Speech Communications and Theater teacher and consultant with 20 years of experience in a broad range of fields. The greater part of her career has been spent within the field of education where she teaches communications classes and coaches nationally-ranked competitive speakers. 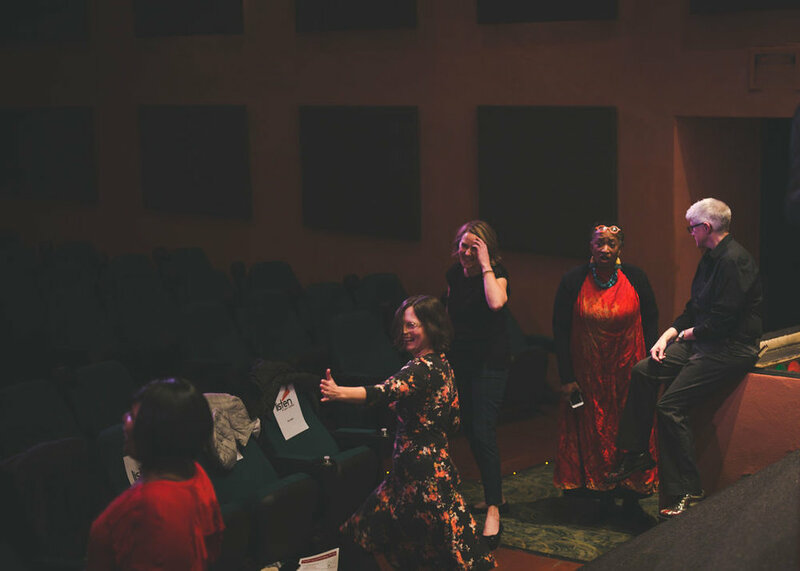 Beyond the educational setting, Tzitel has worked with The Moth and Fringe Festival storytellers in preparation for the stage. She also has had the privilege to work with Public Defenders and Criminal Defense Lawyers on developing skills to share the stories of their clients in the courtroom. Tzitel has made a career out of listening to stories: stories of her students, stories of performers, stories of professionals. She is a teacher at heart and loves to help others find the courage to speak and make their “mess become their message”. Every once in awhile, she even has a story to share. In 2017, Tzitel read, “Little Things” from the LTYM stage. Kris Woll began her writing career at age 7, as founder, editor, and writer of her family newspaper, the Woll Street Journal. 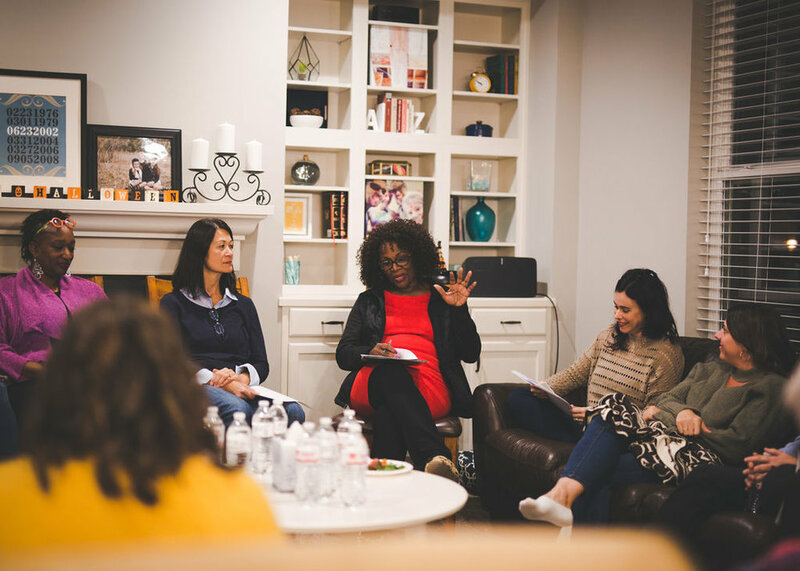 In the years since, her essays and stories on food, home, and history have appeared in publications like Edible Twin Cities, and Brain, Child, and she now leads occasional workshops at The Loft Literary Center on building a creative writing and journaling practice. Kris works in higher education, spends lots of time driving to and from soccer, has a kitchen table covered in art supplies, and lives in Minneapolis. 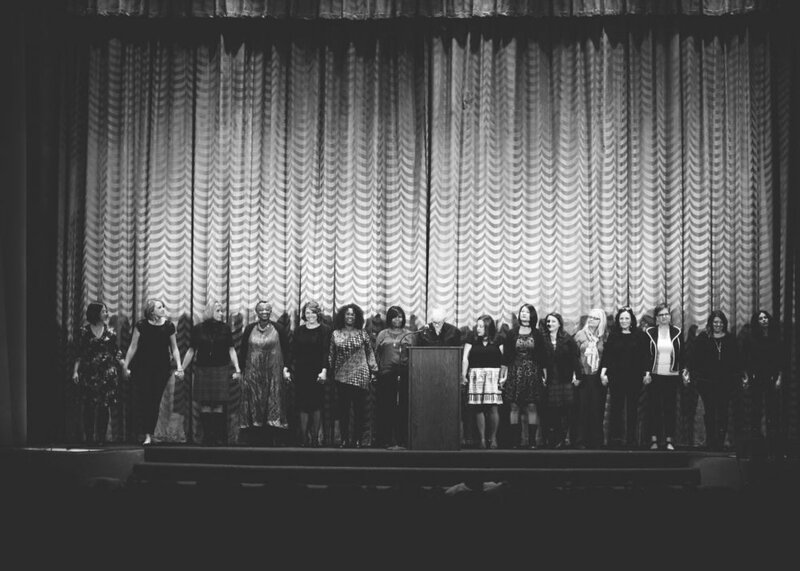 In 2015, Kris read, “A Little Cheer” from the LTYM stage. Laura Zimmermann is a writer, a reader, and a maker of cheesecakes. You might find her at a softball game, a jazz concert, or a nonprofit board meeting, but you'll never find her on a ladder or entering a triathlon. Her debut YA novel will be published by Dutton Books in 2020. She lives in Minneapolis with her three favorite people, who show up in her stories whether they like it or not. 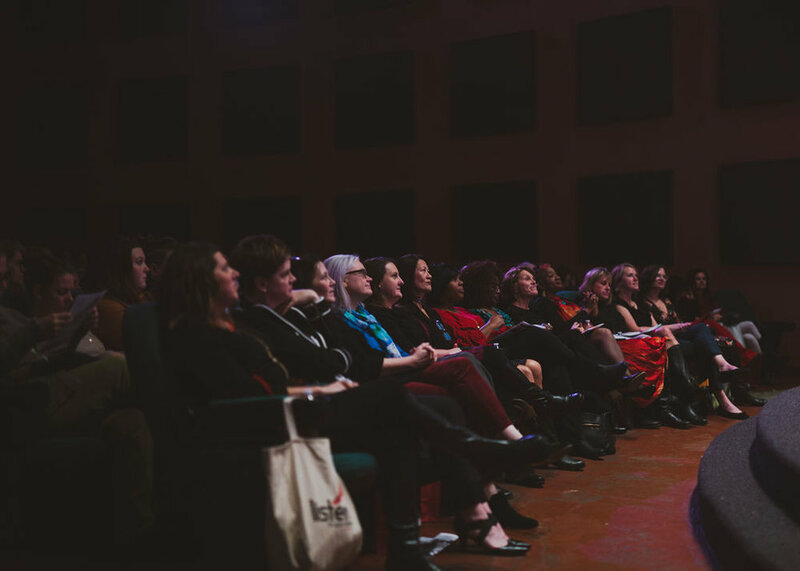 In 2018, Laura read, “Reading Lessons” from the LTYM stage.